NOTE: Should you only need the first two floors (sleeps 8), we offer a reduced rate of $250.00 per night. When renting this option, the third floor is secured and not occupied. The Tabor House was constructed around 1895 and is listed on the National Registry of Historic Places. 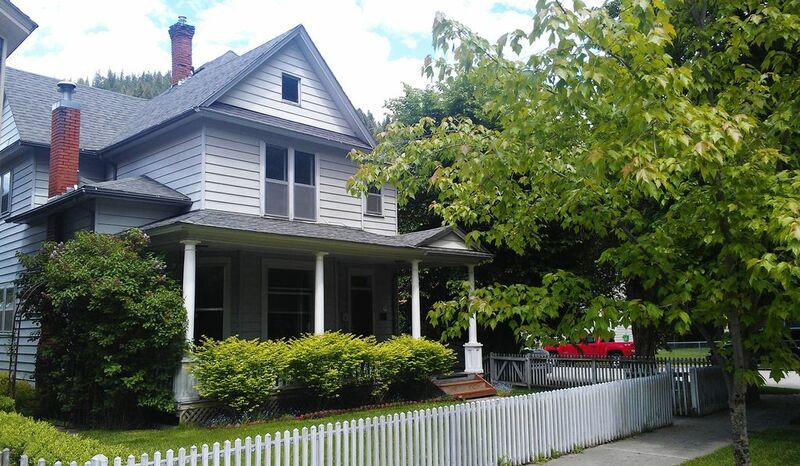 It has all the charm of a Victorian style home with modern amenities and located just two short blocks from downtown Wallace, Idaho. Although the home is not ADA compliant, there are only three short steps to enter the front of the home with a main floor bedroom. The second and third floors are accessible by stairways. has 1 bedroom with a king-sized bed and 37" flat screen TV with Roku/Netflix. A USB rapid charger is located on the wall facing the backyard. The living room has a cozy gas fireplace with remote, a 50" flat screen with Roku and Netflix, a DVD player with a small selection of DVDs, games, puzzles and a book exchange. A Wii game console is located next to the DVD for family gaming. There is a spacious and well supplied eat in kitchen with microwave, glass top range, dishwasher, and full size fridge/freezer with ice maker. There is a large formal dining room, full bath, washer, dryer and gas BBQ (located on the backyard patio area). Just inside the back door entrance is a mud room to put your skis and boots. There is also a radio flyer wagon to pull the kids around town or to get groceries as well as bikes to ride. There is ample parking on the street. Additional covered parking for your motorcycles, ATVs, bicycles, vehicle, etc. can be found at the rear of the residence. We hope you will enjoy the beautiful front porch (our personal favorite). Wave to the visitors on the trolley as it goes by or if you are lucky, watch the elk or moose traipse through town. offers 3 more bedrooms and a full bathroom. Two rooms have queen-sized beds and one room has a double/full. There are flat screen TVs (32") in all the bedrooms also with Roku/Netflix, and lots of closet space. These rooms also have USB rapid chargers located along the wall which are labeled for identification. Or attic has recently been finished with new carpet, drywall, paint, windows. Because we are big on safety, we installed emergency exit (egress) windows. There is also an emergency escape ladder located in a silver plastic storage container in the room. We like to think of this floor as great for the youth in your group as it has 4 single beds in private alcoves (thanks to the gabled ceiling), a 6' 8" x 3' 8"air hockey machine, 32" flat screen with Roku/Netflix, and a classic Nintendo console (remember those?) with games for their enjoyment. This of course does not mean that adults would not find this area fun also! There are four security cameras located at the front, rear and side of the residence. Scotty Baby and Wendy are from Northern Nevada and purchased the Tabor House in 2012. Scotty Baby is recently retired after 35 years in law enforcement. Wendy is semi-retired and has spent much time taking care of and maintaining this beautiful home. We hope that your stay here will spark your imagination while finding peace and adventure here in historic Wallace. Some of our favorite activities include ghost hunting, ATV riding, river rafting, checking out the local breweries and restaurants and skiing. We purchased this property after visiting Wallace. We love Victorian style homes and were fortunate to find this one. The neighbors and community are friendly and a local tour trolley drives around daily during the summer with tourist checking out the town. The area was perfect for us as we ride our ATV's, hike, bike ride, shop and enjoy the local restaurants and bars. Originally purchased as a summer vacation home for us, we decided that we wanted to share the Wallace experience with others when we are not in residence. The town itself is wonderful having been chosen for the making of the film "Dante's Peak". The Brosnan and Hamilton rooms are named after the two stars in the movie, Pierce Brosnan (007) and Linda Hamilton (Terminator). The other rooms two rooms are named after historic figures, The Pulaski Room is named after Edward Pulaski who saved his forestry crew during a major forest fire in 1910 that destroyed most of Wallace. The "Pulaski Tool" which is used by firefighters today is named after him as he is credited with inventing the tool. The Roosevelt Room is named after President Theodore Roosevelt who visited Wallace in 1903. The third floor or attic is named after Wallace's self proclaimed "Center of the Universe" and is known as the "Just Left of the Center of the Universe Room". There are many tree lined streets, Victorian homes and historic buildings all within walking distance. We hope that a stay here will spark your imagination while finding peace and adventure here in historic Wallace. We fell in love with the style of our home and especially the front porch area which is a great place to "Chillax" and BBQ while sipping our favorite adult beverage. The living room, formal dining room and modern kitchen are large and homey. The bedrooms are large (except for the Roosevelt Room) and have views of the surrounding homes and mountains. The home itself just feels right-comfortable and quiet. Both bathrooms are full with shower / bathtub combo. Shower heads are detachable for hand held use. Towels, soap, shampoo, etc. provided. In addition, the first floor bathroom also has a washer and dryer. Antique shops, food establishments, wine and beer bars, entertainment, festivals held yearly. Two Ski Resorts are just minutes away. Look Out Pass and Silver Mountain Ski Resorts within 12 miles of Wallace. Wallace sits on I-90 in between two mountain ranges. Roku with Netflix. Other tiles available for viewing. Front lawn area. Enclosed back yard with patio area. Home is not ADA compliant. Three short steps to front door. There is one large bedroom on the ground floor with king size bed. Great place for kids ! We work very hard at keeping the home clean so that our guests have no concerns and can relax. So glad you enjoyed the size and location. Being so close to the center of town and activities but, not so close that noise disturbs you is one of the benefits. The game area is just one of the many highlights of this historic home. Hope to have you back again soon. Very comfortable home; perfect for our family ski trip at an affordable price. The home was more spacious than the impression we got from the photos. Great kitchen and laundry space, as well as room to spread out for meals and “game time.” Will definitely book again. Thanks Brent, yes the home is spacious, the photos do not do it justice. Having this space allows you to enjoy your time without worrying about bumping in to your other guests. We look forward to having you again in the future. Cozy Home with all the amenities! A perfect home for a large group! This is my second time staying at the Tabor House and it was just perfect. We had a ladies weekend with Mom's and daughter's and the home was just what wished for. Between the festive holiday decorating and the fresh falling snow we couldn't have asked for a more perfect and cozy home. Thank you Scotty for the second visit. Look forward to coming back in July 2019! We are thrilled that you again have enjoyed your stay with us. We always do our very best to make your stay memorable. The Holidays are upon us and we decorated the home to give it a festive atmosphere. We look forward to having you again in July. More changes are coming. We thoroughly enjoyed our recent stay at this wonderful and quite interesting historical home. Furnishings were very comfortable with plenty of room for our party of six. Well kept home with lots of charm and with some very interesting memorabilia. We were steps away from downtown which offered eateries, a very interesting museum depicting the silver mining industry so prevalent in the late 1800’s and early 1900’s, plus a variety of antique shops. Toured the Sierra Silver Mine which was so interesting, and also did a bike ride on the nearby Hiawatha Trail...a 15 mile downhill trail going thru a number of tunnels and some trestles that offered some awesome views of the valley! The owner of the property was very accommodating and answered any of my questions within minutes. A great place to spend a few days on our way to Glacier National Park. I highly recommend it! So glad you enjoyed the home and the area. Your comfort is one of the things we strive for. The memories you will have staying in Wallace and checking out the activities of the area are numerous. Our home is perfect for groups and kids. During the winter, groups of skiers will enjoy being just minutes away from two main ski resorts. Thanks again for staying with us and we look forward to seeing you again. this was a beautiful home. the owners were very helpful. absolutely a wonderful stay. I would recommend this to anyone. Wallace is an amazing town. this house was beautiful. Wallace is a wonderful place to stay and visit and our home is large enough for all to enjoy. We are always striving to make our guests feel at home. The homes location is perfect for anyone wishing to visit Wallace and the surrounding area. Pretty much everything in Wallace is within walking distance. Antique shops, bars, food establishments, coffee house, wine bar and a grocery store are just some of the available businesses. Hiking, biking, ATV trails, fishing and more are also within walking distance. Want to go further? The Silver Express bus service is free, operates year round and will get you to and from the ski resorts and Coeur d'Alene. Wallace was the location chosen for the movie "Dante's Peak".